There is something about buying someone else's project that gives me the heebie jeebies. No matter how much effort, care, and thought was put into the project, there will always be that little voice in your head wondering where they skimped, and if any corners were cut in the process. 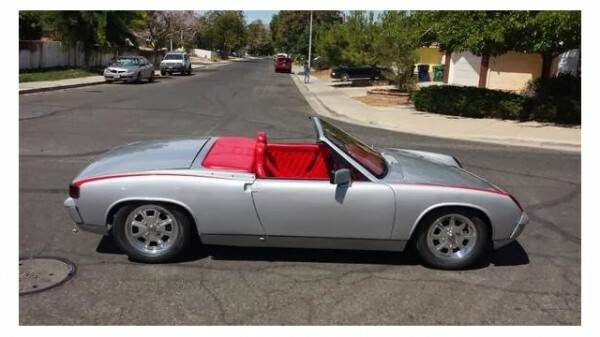 This 914 "speedster" looks great at first glance, and the concept has always been one I've thought promising. Once you peer into the details of the car, though, it leaves a little to be desired. Porsche's 914 has held a place in my mental garage for quite a few years now. It's a slow, but fun drive especially around town in on back country roads. The "targa" rollover bar, and blocky bodywork however, made its exterior appearance something of an oddity when original introduced, especially in a time of swoopy and curvy bodywork. The Porsche shown here, a 1974 2 liter for sale in Palmdale, California for $10,000, however, has been transformed from its original targa layout to a more traditional retractable convertible setup. This 914, in its current state, seems slightly overpriced at $10,000. A few of the aesthetic liberties taken by the builder are not quite my cup of tea. First, the beautiful anodized aluminum windshield trim has been painted black. Secondly, everything is body colored. With the bumpers, bumper top trim, lower fascia, and rocker panels painted the color of the body, it just doesn't look right to me. The black trim around the lower section of the car has always made the 914 look a little slimmer, but in body color, has the opposite effect. In addition, I never particularly liked the large flag-style mirrors when they were mounted on 911s and 924s, and they look doubly out of place on this car. As much silver that has been slathered on every surface of the exterior of the Porsche, I can assure you, even more red has been plastered all over the interior. Boxster Red was an optional interior color in Porsche's 996 and 986 generations. It didn't have a very high take rate, though, because it was absolutely eye-searing. With that much red inside this 914 it looks as though something macabre may have occurred. On another note, I'd be very interested to learn what this Porsche has received in the way of chassis stiffening, if any. 914s are notorious for having somewhat floppy and disconnected chassis, especially with the top out, and a bit of rust set in. Without the targa bar in place, I'd be curious to see how this "speedster" drives. Furthermore, I am absolutely floored that the current owner of this car would place a $10,000 price tag without first replacing the broken and missing left tail light lens. It is certainly an interesting concept, but one that lost me in the execution. You can see the car on Los Angeles Craigslist right now and the original listing can be found at the very bottom of this post. Porsche 356 Speedster Autocrosser Powered by 2/3rds of a 911 Engine. For Sale: 1974 custom convertible Porsche 914 2.0 Fuel Injection, 5 speed speed manual transmission. Beach Boys Racing in Venice, California customized the convertible and raked the windshield back a few degrees for that Speedster look. Car is Silver with custom red interior. Custom made fender decal stripes (can be removed), Polished original Fuch 4 wheels, Pirelli tires. KYB Adjustable shocks, Fuel injection is all new, engine odometer reads 55130 but may not be actal mileage. New Battery, new fuel pump (pressure set at 28 psi), rebuilt computor (ECU), engine bay clean and like new. Paint is like new,custom interior is all new Red, very RARE Momo steering wheel. I also have spare parts that were collected over the years, extra VDO gauges, fuel injection trigger points, and a RARE rear Euro foglight to name a few. I also have the covertible top and frame. Its comes with the purchase of vehicle. However condition of the canvas top is poor and would need to be replaced. I chose not to utilize the top because I enjoy the open top Speedster feel. NO SMOG REQUIRED FOR 1974. Car has been in the family since 1988. California car. MUST SEE TO APPRECIATE! Too much to list. Call or email for complete details. Car is sold as is NO WARRANTY. LOOKING FOR REASONALBLE AND FAIR OFFERS. No reasonable offer refused. 661-794-0136. What is ‘correct’ or ‘incorrect’ about a car that is a one-off custom? As for the missing tail light lens, maybe it’s not missing on the car as offered. After all, the right rearview mirror is absent in the picture of the interior, but present in the outside photos. As well, whether or not the chassis has been stiffened can be discovered. The reviewer only guesses, and then disses. The color may not be perfect, but I rather like the car on the whole. It looks like the owner got tired of messing with Project 2.0. Still, the basic concept has some merit. I hope that someone finishes this project and we get to see another posting on it. I like the concept and have often thought that the profile shape of the 914 would be improved if the lid over the engine followed the curve of the side panel. This car comes close to that and I personally like the shape. If you have ever had a 914 down to a bare tub, you will have discovered the weak part of the car and it is a combination of the opening in the boxed rocker for the heater tube and the opening in the outer box for the jack tube. Close those in and plate over them and the hinge point is gone. The targa bar may offer a tiny bit of lateral stiffness but this could easily be compensated for. I would remover the entire windshield and replace it with a gunther screen, to make the car even more like a 550, Then I would have converted to a six and kept the narrow slab sided fenders just as this owner did. The car chassis will accept 7 x 16 wheels with 215 or 225 50 series tires under the stock fenders. For street use this is all you would need for rubber on the road. Overall I like it, and while I think 10K is a bit steep, I have seen other even more overpriced Porsche cars for sale (not necessarily sold).